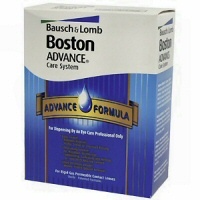 Bausch and Lomb's gas permeable contact lens solution cleaning regime is marketed under the Boston brand. The Boston range offers both an easy one step multi-purpose solution called Boston Simplus, which cleans, rinses, disinfects and conditions, all in one easy step. There is also an ordinary Boston care system and an Advance Boston system, for contact lens wearers who build up lots of deposits on their contacts and require a tougher, cleaning regime, using a weekly enzymatic cleaner. As gas permeable contacts last a long time, it's common for bacteria and protein deposits to build up on the lenses; these are often very difficult to remove, even if you regularly rub and rinse your lenses. So the solution is to adopt a cleaning and disinfecting regime using two different products and also a weekly enzymatic cleaner to remove those ultra stubborn stains, and this is what the Boston contact lens solution Care and Advance sytems do. The Boston conditioning solution is used for wetting and soaking lenses and acts very much like a multi-purpose solution. Stubborn deposits are removed at the end of the day using the Boston cleaner, where you need to rub lenses in the palm of your hand for at least 20 seconds. You then rinse the lenses in fresh TAP WATER (this is to remove all traces of the cleaner which could irritate your eyes), and soak the lenses in fresh conditioning solution for at least 4 hours/overnight. Simply add the liquid drops to your lens case, filled to the very top with Boston conditioning solution, and leave to soak overnight. NB: It's important to fill the lens case completely so that the correct "mix" is achieved between the drops and the solution; if there is too high a percentage of enzyme cleaner, then your eyes may become irritated. Then rinse off any trace of the enzymatic cleaner with the conditioning solution (NOT tap water), wet the lenses with a few drops more conditioning solution and insert. There are many places to buy discount Boston lens solution online. One of the best ways to purchase it is to buy the solution in kit form, especially when you are using the multi-product care systems described above. AC Lens offers excellent prices on every Boston contact lens solution, plus free shipping on orders over $99, so it's a great site to order both contact lenses and solutions, all with the just a few clicks of the mouse.